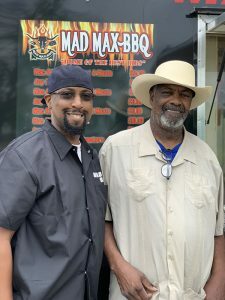 “Home of the Best Ribs” is a title not simply displayed on the back of owner Tevron Maxwell’s shirt, but a claim verified by Mad Max BBQ customers in the Five Corners District. And, I would argue that Tevron’s BBQ food truck is also home to the best potato salad and country beans around. “Some people come just to get the beans!” says Tevron, as he pulls out large tins of hot beans mixed with ground beef from off the smoker attached to his truck. 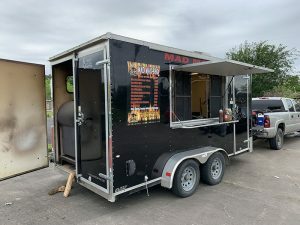 The mouth-watering, smoky aroma of ribs, chicken, and brisket, and pulled pork is his best advertisement, bringing in hungry customers driving down West Orem. “I offer free tastes of my BBQ because I know people will love it when they try it,” says Tevron. 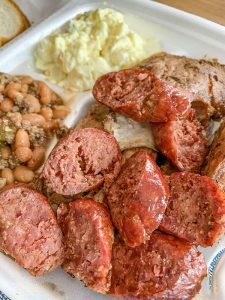 Once I tried his freshly grilled meats with homemade sauce, potato salad, and beans, I understood. I’m hooked. And I’m convinced that it is impossible to feast on the tender and flavorful meats and sides at Mad Max BBQ only once. Barbecuing is a skill that has run in the Maxwell family for generations. “My father, Lester Maxwell, taught me everything I know,” says Tevron admiringly. “He comes here just about every day. He still helps cook, teaches me different techniques, and he likes to compete against me to see who can make the best ribs,” he laughs. Lester did make an appearance during my visit. I knew I had to ask him, “How did you learn how to BBQ?” It turns out that Lester was also taught by his own father, a Houston native with a love for BBQ. It was this inspiration that caused Lester Maxwell years ago to dream up the concept of owning a BBQ restaurant in his neighborhood. “On the weekends my father would fire up the pit and cook for the neighbors. They would tell him the food was so good that he should start a restaurant,” remembers Tevron. After experiencing difficulties with brick-and-mortar buildings, the Maxwells decided that their best bet, with the least overhead was to open a food truck. “Sometimes people are leery about eating at food trucks. But many times, food trucks are better than restaurants,” Tevron says. But after suffering from multiple strokes, Lester handed the reins of the business to Tevron. 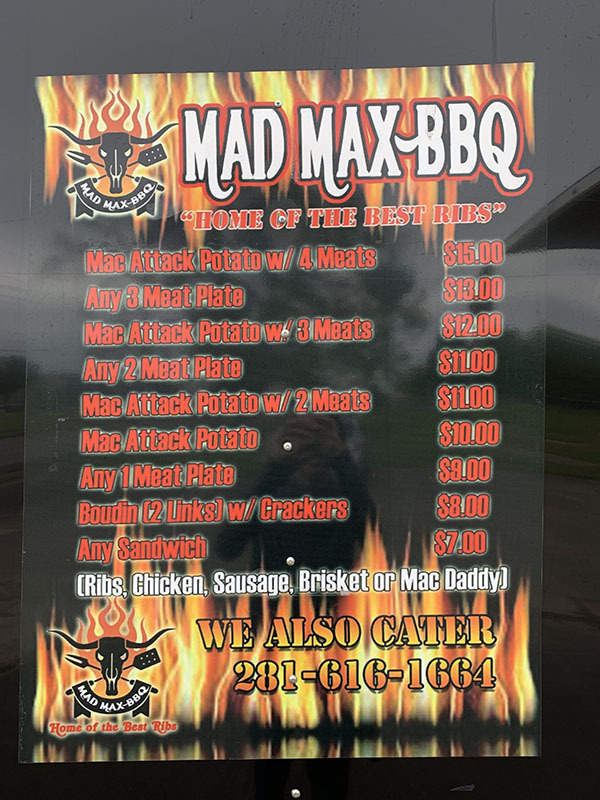 Mad Max BBQ has now been wowing customers from this current food truck for two years now. The Maxwell’s in-depth knowledge of how different types of tree bark affects the taste and appearance of meat is one reason that they stand out in a city famous for BBQ. “People usually cook with wood, but we cook with just the bark,” Tevron explains. The Maxwells take their role in the community to another level past simply serving food. You may have seen Tevron providing free BBQ in the Five Corners community, at “back to school” events, assisted living homes, distributing food to hurricane victims, or the homeless. He also provides catering for companies and private events. If you want to be part of the excitement, it’s best to get to Mad Max BBQ around lunchtime hours. The truck opens at 11:00AM on Tuesdays, Wednesdays, Fridays and Saturdays, and they’re sold out by about 3:00 or 4:00PM. 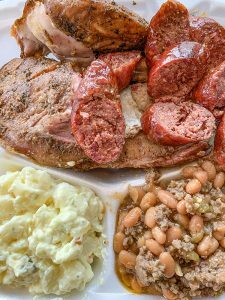 I recommend making a “mad” dash to try this masterfully prepared BBQ (and please don’t forget the sides! ).